Crowds pack the San Diego Convention Center on the first day of Comic-Con in 2013. Photo by Luis Monteagudo Jr.
For those about to geek, we salute you. We’re talking to you, Comic-Con attendees. Comic-Con International 2014 is almost here and the annual massive celebration of all things pop culture doesn’t seem to be slowing down. This year’s event will run from Wednesday through Sunday, promising a non-stop, noisy, sweaty, overstimulated week of movies, television shows, comic books and video games. Now in its 44th year, the Con has grown up. It’s not the pimple-faced, squeaky-voiced teenager any more. It’s smarter, more mature. But with that age has come some problems — impossibly long lines, jampacked hallways and ballrooms and an urban sprawl that requires you to wear your most comfortable shoes and pack some aspirin. 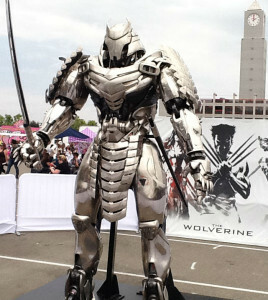 What started out as a small gathering of comic book fans in a hotel ballroom has exploded into a global pop culture festival that has burst at the seams of the cavernous San Diego Convention Center and spilled over into Petco Park and downtown’s Gaslamp quarter. A display at Comic-Con 2013. Photo by Luis Monteagudo Jr. This year is no exception with more than 130,000 fans and media expected to descend onto the convention center and downtown area. And that’s the just lucky ones able to buy passes or get credentials. But fear not, true believer. If you couldn’t get a pass to Comic-Con this year, or if you’ve never been and are curious about it, you can still enjoy it. The easiest way is to simply plop yourself down in a Gaslamp restaurant and watch the parade of costumed fans walk by. There’s also the annual Zombie Walk through the Gaslamp. A couple of hundred fans dress up as zombies and walk up and down Fifth Avenue, in front of the convention center. The makeup can be elaborate, and there are all kinds of zombies, including children with their parents. Just beware that the Zombie Walk has become incredibly popular so get there early if you want a good viewing spot. This year’s Zombie Walk is scheduled for Saturday at 5:15 p.m.
Because the convention center alone isn’t big enough to hold all of Comic-Con now, there are events and attractions sprinkled throughout the Gaslamp, including the parking lot next to Petco Park, the Tin Fish square in front of the Hard Rock Hotel, the pedestrian promenade alongside the trolley tracks facing the convention center, and various bars and restaurants. Most of these attractions will require you to have a Comic-Con badge to get inside. But there’s usually plenty of selfie-worthy sights outside. As for the happenings inside the Con this year, the most hotly anticipated development will be whatever news we’ll get about the new Star Wars movie. Now that actual filming has started, don’t be surprised if we get a brief video featuring director J.J. Abrams talking from the overseas set of the movie. We can hope for a shot or glimpse of the reportedly life-size Millennium Falcon set on a sound stage. If so, expect nerd nirvana. We’ll also be looking for any footage of the “Superman vs. Batman” movie, which has already generated controversy due to the casting of Ben Affleck as Batman. There’s already been press photos of the next big Marvel flick, “Avengers: Age of Ultron,” so footage or announcements are possible. And we’re hoping to catch the exclusive premiere of the first episode of “Gotham,” the fall’s most anticipated show, featuring a look at young Bruce Wayne, Commissioner James Gordon and the villains of Gotham City. So, whether you have a badge or not, brace yourself for an exciting week. 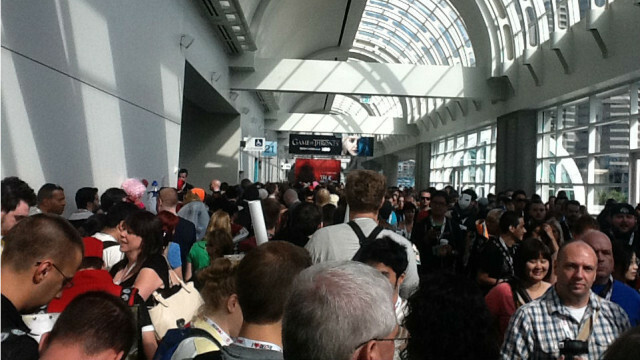 Comic-Con has become San Diego’s biggest, signature event and you don’t want to miss it!